The thoughts, ramblings, and ideas of Doug Hibbard. This probably isn’t the first think Bob Kulhan had in mind when he wrote Getting to “Yes And”, but here’s my first response: this book demonstrates exactly what we have lost in the general education of America as we set aside the arts for budgetary concerns. Seriously, you are working through an entire book written by actor/comedian about how to apply the same tools from drama/comedy improv to your business and see how things change and improve. If we would have been teaching and encouraging arts all along, the need would be very different. However, somehow we lost sight of the idea that preparing people for life was about more than just comma splices and times tables. We misplaced the idea of stretching our minds. This is where Getting to “Yes And” comes into play. Bob Kulhan has primarily been an improv comedy actor, but in recent years has worked to apply those skills in helping train business people to think outside the written plan. This book is an attempt to distill what many seminars and training sessions have taught. First, of course, a comment or two about the book itself. The writing style is clear and organized. Since one tends to think of improv as jumping around a bit, it was good to see that Kulhan followed logical lines of thought in presenting his views. The nine primary chapters build well on each other. It is unfortunate that the publisher (Stanford Business Books) put the notes as endnotes instead of footnotes—there weren’t many and it would be better to have them accessible. Overall, though, the writing style is easy enough to read without making one feel dumb while reading it. Somehow, too many books that aim for “accessible” use it as cover for “dumb.” Now, there are some classic business clichés present in the writing. For example, the old saw of “How do eat an elephant?” makes an appearance, as do a few others. The thing about such phrasings, though, is that they make the point. Second, content. After all, content matters—grammar and writing style only pave the way for good content, they don’t replace it. Kulhan shares various stories of how he has worked with businesses to work improv sessions into corporate training. Especially helpful are the ideas about breaking through when structures get too siloed and the isolation is choking the business. The opening content lays the groundwork of using improv for self-improvement. That’s a key component and increases the value for individual readers. After all, your boss may hate these ideas—and has a responsibility to make sure they are valuable before the business heavily invests them—so you will need to work out how much help you find first. In all, this isn’t a light and funny book, though looking at Kulhan’s website shows he can be light and funny. It’s a good introduction to shaking things up in your mind, so that you can get more work done. Practical points are included, as are tips for dealing with those who object and refuse to try. I like it. Book provided in exchange for the review. And, yes, I would never have read it otherwise. 1. “Yes, and…” is the key here. We usually respond to new ideas with “no” or “yes, but…” and these two answers are practically the same. They are ways to shut down an idea. 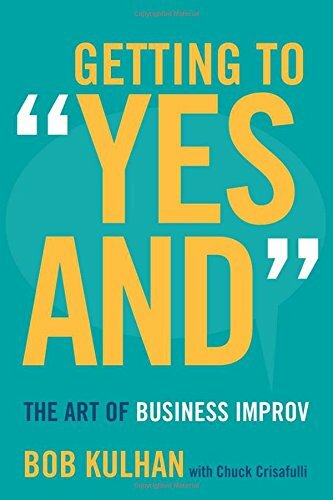 “Yes, and…” embraces a good idea and then suggests taking that energy forward to another problem at hand. For example, we need to deal with handicapped accessibility at our church. We need to install an elevator, which is expensive. But the issue is this: we want to reach all kinds of people, so we spend money on outreach—yes! and, “all kinds of people” includes folks who cannot navigate stairs, so we see this as outreach work. Not just building code work. But…what if nobody needs it? Then we ought to redouble our efforts to reach all kinds of people, including doing special work to reach those who will use an elevator…and whoever else we can find. 2. Silos—this is what most churches are. There’s a nursery silo, a children’s department silo, a youth silo, a music silo, a men’s silo, a women’s silo, and so forth…and the typical response is that everybody needs a silo. But then the farm stumbles. What happens when the women’s silo needs more space because somehow, the harvest is currently women? Think around it, build around it. What about when there’s a silo that you don’t really see long-term growth in, but it holds some valuable folks? They like this one thing…well, how do we spread that enthusiasm? It’s a good plan to consider and spread the ideas across the whole farm.